Four years after the Associated Press (AP) mounted its signboard on a wooden door inside an armed compound in Pyongyang, Agence France-Presse (AFP) announced that it would become the second global news agency to open a bureau in North Korea. “Good luck to @AFP on the wild ride ahead,” I tweeted after their announcement. I should know about the rollercoaster that awaits AFP; I opened the AP’s Pyongyang bureau in 2012. While working for the AP, I was under orders to view AFP and Reuters as our main wire service competition. My colleagues and I lived to get the news out before them, even if only by seconds. Naturally, we gloated over being the first to open a bureau in North Korea, and during my tenure as AP’s Pyongyang bureau chief, I did my best to keep our North Korean counterparts so busy that they had no time to embark on similar negotiations with our competitors. But in truth, as a champion of press freedom, I’m heartened to learn that the small foreign press corps in Pyongyang will expand later this year with AFP’s arrival. After all, the more foreign journalists get on the ground in North Korea, the more competitive and competent the coverage will be overall. However, building a news operation that adheres to Western standards of journalism won’t be easy—hence my good luck tidings—and the AFP agreement is neither a sign that North Korea is opening up nor a guarantee that foreign media access will improve. If anything, by allowing AFP to open a Pyongyang bureau, North Korea is demonstrating increased confidence in its ability to keep foreign journalists under control. In 2012, when I became the first American bureau chief in Pyongyang, North Korea ranked at the very bottom of global rankings for press freedom: No. 197 of 197 countries at the end of 2011, according to Freedom House. “North Korea remained the most repressive media environment in the world in 2011,” the 2012 report notes. “North Korean media portray all dissidents and foreign journalists as liars attempting to destabilize the government.” The opening of the AP’s Pyongyang bureau surprised many who never imagined North Korea would let in “enemy” journalists, and raised hopes of improved access in a country wary of the West. North Korea’s standing in censorship rankings even jumped up a notch accordingly from the worst in the world to the penultimate spot. However, criticism of AP coverage was rabid in the early days as skeptics ripped apart the reporting without comprehending how difficult the conditions were on the ground. They wrongly assumed everything I wrote was dictated and censored by the Korean Central News Agency (KCNA) before it hit the wire. They lambasted me for not writing from Pyongyang about labor camps that I was not allowed to see. They had no inkling of the Herculean effort it took to build trust and to negotiate access to places and people historically suspicious of foreign journalists, not to mention Americans. Doing good journalism in North Korea was difficult as it became apparent the North Koreans and I had different objectives when it came to coverage. I wanted to share what daily life was like across North Korea. The North Koreans wanted us to transmit only stories and images of Pyongyang that make the country look strong, beautiful and powerful. 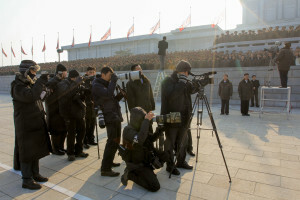 Outside observers tend to focus on monitoring as the main obstacle to good journalism from inside Pyongyang. Deutsche Welle asked Philippe Massonnet, AFP’s Asia-Pacific director, whether AFP’s work would be monitored by a board of North Korean censors. Indeed, the big question is not whether AFP’s foreign staff will be monitored—they will be—but whether they’ll be given access to the people and places that will truly further understanding of what is happening across North Korea and not just in the well-to-do pockets of Pyongyang. Smart to the reality of what foreign journalists can cover in North Korea, or perhaps conceding to conditions laid down by the North Koreans, AFP was clear that its focus would be on video and photography. So, perhaps we should not expect any epic investigative reporting from the future AFP bureau, either. Four years ago, it was a bold move to let an American news outlet set up shop in Pyongyang, and the North Koreans deserve credit for taking such an unprecedented step. Expanding the foreign press corps to include Paris-headquartered AFP is a welcome step in the right direction. But press freedom for foreign media has diminished in other respects. For a long stretch in 2014 and 2015, almost no Western reporters, not even my successor at AP, were allowed into the country. (The North Koreans cited Ebola for the ban.) Since then, the Foreign Ministry has handpicked the news outlets granted visas to cover orchestrated spectacles designed to glorify North Korea. The ministry has favored TV networks and wire service photographers they trust will transmit beautiful images. The written word, however, is seen as a threat. Most US newspaper and radio reporters have been shut out in recent years. We live in a world where images, moving and still, dominate as the attention span for news diminishes. In 2013, North Korea lifted a ban on foreign cellphones and began granting foreigners 3G Internet access, paving the way for social media in the world’s most closed-off country. Since then, the real-time snapshots and video sent from inside North Korea have brought the country to life for millions of Instagram users. But to understand North Korea, we need far more than interesting pictures. It is through long stretches of reporting on the ground, by experienced journalists who understand Korean culture and history and have built a network of reliable sources inside the country, that we will truly learn about North Korea. Photos from North Korea offer us a beguiling glimpse into life inside a country largely cut off from the outside world. But we need more than a one-line caption to understand the circumstances and context of images taken in a repressive media environment. AFP and AP deserve credit for making long-term investments in news gathering in North Korea. There is a dismaying dearth of knowledge among Western reporters covering North Korea today; very few speak Korean or have any background in Korean culture or history. By carrying out in-depth reporting on the ground, as I did in the early years, foreign reporters and photographers will become better equipped to sift through the propaganda and to ferret out the real developments happening across North Korea. They’ll also become more adept at requesting interviews and making editorial decisions that adhere to Western journalistic standards. On the other hand, outlets such as CNN have chosen to make regular visits to Pyongyang rather than to open a bureau. For CNN, the reporting trips have produced a number of “exclusive” interviews—some apparently at the behest of the North Korean government. For instance, a recent CNN interview with a man who identified himself as a South Korean-born US citizen certainly qualifies as an exclusive; even AP had to cite CNN in its report on the alleged detainment. (One day earlier, CNN also carried an interview with a South Korean-born Canadian pastor serving a life sentence in North Korea.) However, as the cable network acknowledges, the interview with the American was initiated and arranged by the North Koreans. “The U.S. needs to find a way to reconcile with North Korea. I think the main way to do that is with a peace treaty,” he added, parroting Workers’ Party rhetoric in an interview that the North Koreans knew Washington would be watching. CNN deserves credit for getting access that no other US broadcaster had in the days after North Korea conducted a nuclear test on January 6, 2016. But the interview was a coup for the North Koreans, not CNN. Cases like this show we need more foreign media on the ground to start filling in the gaps of knowledge on a story otherwise shaped by North Korea’s own propaganda and the outside world’s ignorance. But having access inside North Korea comes with responsibility—not only to provide experienced, informed reporting but also to uphold journalistic standards. Too often, news outlets allow those standards to slip when it comes to North Korea. By letting the North Korean government dictate interviews and itineraries, media organizations not only cede control to them but also weaken press freedom by tacitly accepting the restrictions laid down by the regime. AFP’s Massonnet, in the DW interview, was candid about the complicated nature of reporting under repressive conditions. I appreciate the candor and transparency. But I hope that his team will take on the mantle of responsibility of expanding press freedom in North Korea by pushing for better access rather than letting Pyongyang dictate their coverage. And I urge the North Korean government to build on the momentum by allowing in more foreign correspondents in the months and years to come. Four years ago I raised a glass of champagne to toast the historic opening of a US news bureau inside a country still technically at war with my own. That moment felt like a victory, but in truth, the battle had just begun. Journalist Jean H. Lee is a former AP foreign correspondent who served as chief of the news agency’s bureaus in Seoul and Pyongyang. She now teaches North Korean media studies at Yonsei University in Seoul, and is on Twitter and Instagram as @newsjean.